For lifelong backpacking enthusiasts and beginners alike, Canyonlands National Park is the place to plan your next backpacking experience. This surreal desert landscape encompasses the beauty and rawness of the American Southwest with red mesas, canyons, ravines, and colorfully layered mountains, sculpted by millions of years of nature. You will need a permit and a reservation to backpack in the park overnight. Some permits can be on a walk-in basis, but it’s highly suggested to get a permit as far in advance as possible to make sure you get the trip you want. Due to high popularity, some places fill up fast. You can reserve your permit as early as four months in advance and as late as two days before the date you want to go. The Needles – the most popular Canyonlands backpacking experience. If The Needles is on your bucket list, it’s on a lot of other people’s, too. That’s why it’s important to reserve your permit as early as four months in advance to get in, especially during the spring and fall, when this area is the most popular. Campsites are set up along the backpacking trail. Island in the Sky – a stunning mesa that sits over 1,000 feet above the rest of the red desert terrain of the Canyonlands, this is more difficult than The Needles but less difficult and remote than The Maze. Murphy’s Point is perfect for an overnight backpacking trip, but the water at Island in the Sky is difficult to purify. The Maze – The most remote backpacking area of the Canyonlands. This is the most difficult area of the park to traverse, making most trips to this area shorter than three days. For a sense of seclusion and beauty, this backpacking trip is great for you if you’re up for the challenege. There are no services, food, gas, or potable water sources in The Maze, and quoting from nps.gov, ‘Visitors must be prepared for self-sufficiency and the proper equipment or gear for self-rescue’. You can’t camp within 300 feet of a water source, archaeological site, or historic site. Wood campfires aren’t allowed, but you can still cook with a charcoal fire in a firepan at vehicle campsites. It is required to remove all garbage (including toilet paper) from the backcountry. For more info on Canyonlands National Park, click here. A light long-sleeved tee shirt to protect from the sun and bugs, wicking underwear, wicking tee shirt, waterproof jacket and pants (or pants that dry quickly), a hat (to shield your head and face from the sun), and, for cold weather, rainwear, cap, gloves, and fleece jacket. Bring clean cotton clothes for sleeping and extra socks. Go with a partner or in a group. The more the merrier with backpacking trips, and oftentimes, the more the safer. If you’re a beginner, go with an experienced backpacker to get ahead of the learning curve. Also, more people traveling in the group means that various items (such as a stove or cooking supplies) can be distributed amongst the group, and means less weight to carry individually. Don’t choose a route that’s too far out of your skill range. If you’re a beginner, research thoroughly into the trip to see if it’s something you think is in your skill range. Make sure your backpack is comfortable to wear. Take it on a test run with considerable weight in it to see if it weighs on your hips or shoulders too much. Condition your body for the trip. Carry a pack on your back on shorter hiking trips and build the primary climbing muscles in your legs. Be prepared for shortness of breath in altitude differences. Make sure your hiking boots fit properly. Lightweight boots with good traction are the best. Wear them out before the trip to avoid getting painful blisters on your feet that can ruin the trip. With a name as surreal and unique as Fairyland Point in Bryce Canyon National Park, the trail lives up to its name with its peaceful seclusion and striking features across the colorful terrain of the park. Wind through a forest of hoodoos and sloping red hills to fully absorb one of the best trails the park has to offer. This trail is not only a way to get out and enjoy the clean air, it’s a way to exercise and live the experience that Bryce Canyon has to offer. The entire 8 mile hike typically takes 4-5 hours to complete, so it’s advised to bring plenty of water and snacks for the trail. During the summer, temperatures can be warm, so dress light, wear sunscreen, bring a wide-brim hat to avoid sunburn. The trail features a few changes in elevation, making it one of the more strenuous hikes in the park considering its length and steep elevation changes. The lowest point of the trail sits around 7200 ft. in altitude, while the highest point is around 8100 ft. in altitude, with many elevation changes in between those points. On the northern end of the park, this scenic day hike also features a trail to Tower Bridge. Although the trail is considered strenuous, the trail is well-cleared and graded tracks for those who might generally struggle with other difficult hikes. Enjoy pink silt-stone framed trails on this quiet hike through some of the most colorful desert scenery on earth. Park Shuttle info: The free park shuttle bus (with NPS entry fee) runs between both Fairypoint and Sunrise trail heads (9 a.m. to 6 p.m.) about every 15 minutes from May 23rd to September 28th. Bike racks are at both trail heads. With the growing threat of the rapidly growing Brian Head Fire, many places in Southern Utah feel solemn. Despite this incoming threat that has so far evacuated over 1,500 residents in the area, the annual Panguitch Valley Balloon Ralley was not cancelled for the weekend after the fire began and started to rapidly grow in the nearby town of Brian Head. While smoke filled the Panguitch Valley from the nearby fire, making it hard to see the festivities and balloons, it was a great way to lighten people’s spirits and give a reminder to everyone that there is hope and to remain positive, even during threatening times. Over 36 hot air balloons launch into the sky, glowing during the evening as festival goers are welcome to walk around vendors and restaurants that keep their doors open late for this event. There was live music, inflatable rides for kids, a raffle, biker parade, bingo, bike show, parachute jumping, and a craft fair, starting Friday night and going until Saturday night as the balloon glow happens. Saturday morning, a 5k started at 7:30 AM. The fire has since evacuated parts of the Panguitch Lake area to residents living on the west side. As of June 28, 13 homes have been destroyed, many in the Panguitch Lake area. Over 1,600 personnel from all over the nation are helping out with this fire that has grown over 50,000 acres in ten days. There is only 10% containment reported on the fire, but the Panguitch community is grateful to the firefighters who have come to help save their mountains. For more info on the Brian Head fire, click here. Photo from the Balloon Rally’s Facebook page. 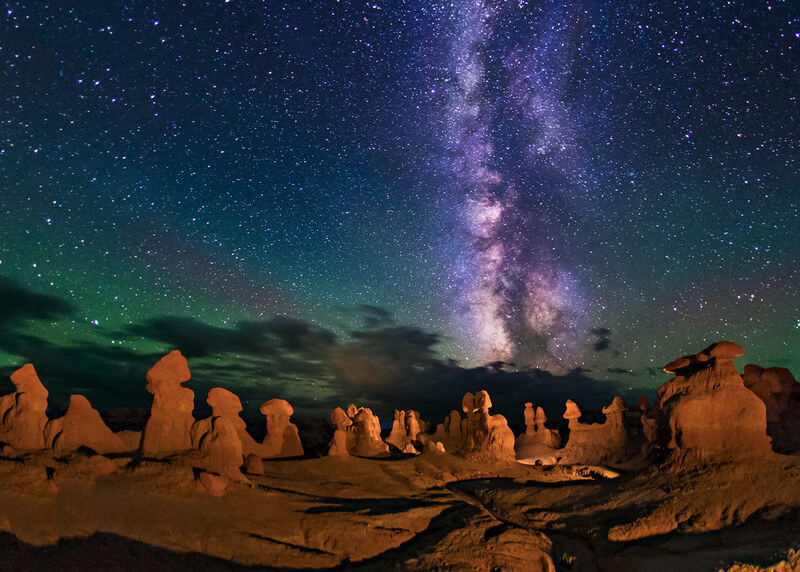 Goblin Valley is one of the most untouched places on the planet – by light pollution at night, that is. That’s why it attracts so many photographers in the dead of night to photograph the stunning night skies, showcasing the Milky Way like you’ve never seen it before. It’s beautiful in the daytime as well, but its view of the night sky is unchallenged by most places in North America. For more information on Goblin Valley and night photography, click here. Here’s a helpful video for beginners planning to fish at Panguitch Lake, or even for experienced fishers who want to improve their fishing this summer. Cutthroat and Rainbow trout are the most common fish you’ll catch at the lake and this video goes through helpful tips on how to catch more trout. Boats and fishing gear are available to rent at Panguitch Lake during the summer.